Throwing rubbish away seems like an unchanging, everyday part of life. After a renovation, project, or yard clean-up, you just throw all the rubbish in a skip bin and it’s done. However, there are details on proper waste disposal that might have escaped your attention. Committing to proper waste management practices has many real benefits to you and your space. The benefits of proper waste disposal are gaining a lot of attention and awareness in homes and offices across the country. Adding your efforts to the list can only benefit you, your community, and the environment. What is Proper Waste Disposal? Proper waste disposal involves committing to waste segregation. Before you dump all your old things and scraps to the bin, sort out materials that can be re-used and recycled. The leftover waste can then be sorted into organic waste, inorganic waste, non-recyclable material, and even compost that can be packaged and sold. These practices are aligned with environmental policies that the whole country is working towards. Lake Macquarie skip bin hire services and other waste management companies are even adding to the effort, making it easier for you to commit to proper waste disposal. 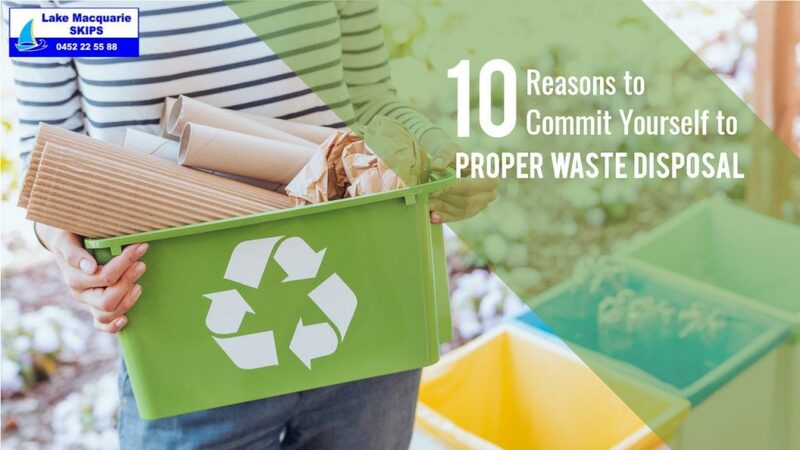 Here are ten good reasons why you should recycle, reuse, and segregate your waste. The first reason why you should commit to proper waste disposal is its impact on your space. By setting apart an area outside or even inside your home or office, and by regularly having your rubbish picked up, you can ensure your space remains clean and orderly. Without rubbish accumulating in your home or office, you have more room to organise and move around. Many households make the mistake of stashing junk –old furniture, broken appliances, and big pieces of trash and debris—in the backyard. This makes a mess of your landscape. It reduces the visual appeal of your home. Plus, it is the perfect breeding ground for rodents and other pests. Proper waste disposal helps clean and clear your landscape, whether it concerns your backyard or your sidewalk. Strategically placed skip bins can help you maintain a neat appearance. One of the biggest concerns when it comes to waste disposal is health and sanitation. Festering and rotting waste is a breeding ground for bacteria and mould. Without proper waste disposal, your home is vulnerable to the spread of disease. Improper waste management, which can include scattered rubbish or late skip bin hire pick-ups, can lead to skin rashes, allergies, or worse problems. Waste attracts pests like insects and rodents. Perishables especially need to be thrown out of the home at least once a week. It is best to have a trash can outside your home, to reduce the harm of pests and to avoid the pungent smell. Gadgets, metals, and chemical wastes can decay and create harmful biohazards. These can leak and contaminate the soil and water, or particulates can mix with the atmosphere. Proper waste disposal requires liners that can prevent the harmful leakage of biohazards. Before the advent of proper waste disposal practices, people were harmed by burning waste in landfills and backyards. Respiratory problems, like asthma and emphysema, and systemic diseases can develop. Communities are better off with proper waste disposal. Aside from benefitting your individual and community safety, proper waste disposal is also a responsibility towards the environment. Waste management reduces the burden of plastics and mass generation of materials. It also promotes composting and other practices that do not contribute to climate change. Throwing trash carelessly can be dangerous, especially when dealing with sharp objects like rusty nails and glass shards, and with caustic chemicals. Hiring a waste management company can go a long way towards ensuring physical safety. Many people do not know this, but the community can benefit from the energy generated from the incineration of waste in some landfills and small-scale sites. The gases from the disposal process can also be converted to electricity. Sorting trash and identifying recyclables, sellable appliances and furniture, and reusable plastics, glass, and wood products can help you earn some money on the side. Whether it’s cleaning up your yard or fixing up after a renovation project, proper waste disposal has clear benefits for you, your household and your community. Lake Macquarie Skips can help you on your journey. With a convenient online booking system, you can easily rely on professional delivery and pick-up services to keep your home neat and clean. Call 0452 22 55 88 today!